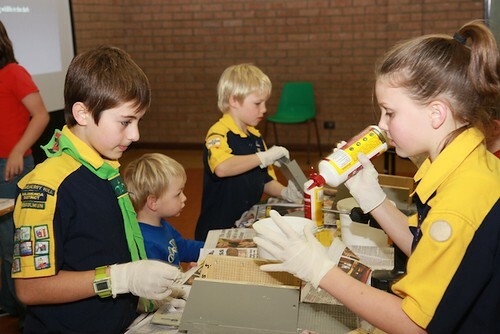 We specialise in offering community groups, schools , government and private bodies hands-on bat box building workshops. There is something about holding a hammer and constructing a timber object. Perhaps it’s a primeval urge that hides deep down in all of us. Whatever the reason there is a great sense of achievement when the participants finish the boxes. Here you have a chance to help the environment and provide a real working home for the under-rated micro bats. At the beginning a 25min bat conservation and ecology presentation is given. Then straight into the hands-on work.We supply all materials provided. This includes pre-assembled kit form pre-painted boxes, glue, screws, hammers and battery drills. We arrive at your location with five boxes. We only need one room with tables and power for the presentation. The participants then dissemble them in their pre-determined groups. Working together they then glue the timber sections and use the battery drills to finally screw it together. We can cater for up to 30 participants per session. Depending on the group the boxes can be taken away and installed at your home or a location of your choice if it is a special group. For schools when the boxes are finished and painted we return to install them. Many schools have bush areas close by which make it ideal for the boxes. The children love to write their names on the boxes that they built. This gives them a sense of responsibility in looking after them. During the installation process the students are instructed on the use of a GPS. They then enter the coordinates and record positions. With the internet they then can use Google Earth to view them. Well, apply for community grants. They are available online locally. Do you have a branch in Queensland? My 2 sons are in a Scout Group and we would love to start making boxes! Unfortunately I don’t. But why don’t you try to find a “Mens Shed” in your area. Ring up your local council and find out the closest one. Some of the guys might want to take up the idea and help your sons. It’s not that hard to build them. Just need a little enthusiasm. hi my name is gary and i live on 2 acres in wagin there is a small spring near my house and at night i can see one bat flying around . i would love to build some bat boxes to hopefully increase there population i have a few hollow logs would these be any good to turn into bat boxes. ?is there any one around i could talk too to help my do it properlly. any help would be apretiated thanks gary johnson. Gary, in the wild bats actually live in hollow logs. So you can attract them to these homes. Cap them top and bottom, with a piece of sheet metal. Create a 50 millimetre entrance hole towards the top. Use fencing wire and lash them to the tree. Mount them vertically. 2.4 m is high enough. Take great care when installing. Use a stepladder.Have fun. Hello Gary, I live in Baldivis on a rural property and would absolutely love to attend a workshop with my children. We are in between schools currently so I can’t really approach either principals just yet but would it be possible for the three/four of us to attend via another local group nearby? A bit like crashing a bat box party?? Hi Sally, if you reply to my email at joe@gobatty.com.au I can add you to my waiting list. The workshops can be conducted anywhere and everywhere. Cheers Joe.